Tel Aviv University's Tal Dvir presents his work on cardiac tissue engineering. Northwestern Engineering Dean Julio M. Ottino addresses workshop participants. Professor John Rogers presents his work on stretchable, flexible, bio-integrated electronics. Guests listen as Northwestern and TAU researchers present their research at the collaborative workshop. Professor David Seidman, workshop co-chair, mingles with guests at the closing reception. Guests enjoy the workshop's closing reception in Cohen Commons. Someday, a major tool for fighting heart failure could be a 3-D printer. 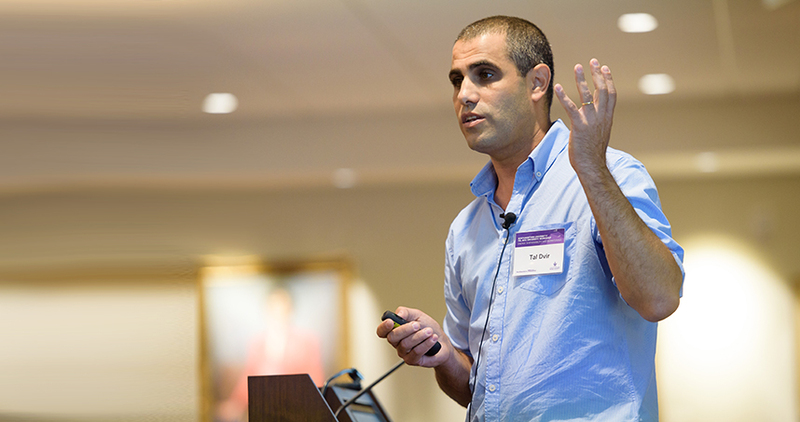 At this week’s Northwestern University/Tel Aviv University Workshop, Tal Dvir presented his research into 3-D printing heart muscles and believes that, in the future, his lab could potentially print an entire, functioning heart. Focused on the themes of energy, sustainability, and biomaterials, the workshop took place from September 20 to 22 on Northwestern’s Evanston campus. Last year’s workshop in Tel Aviv, Israel was based around the theme of semiconductors, electronic materials, thin films, and photonic materials. The workshops mark a strategic partnership between Northwestern and TAU and aim to build new and strengthen existing collaborations between faculty members at both universities. Northwestern Engineering’s John A. Rogers also presented his work on biomaterials. 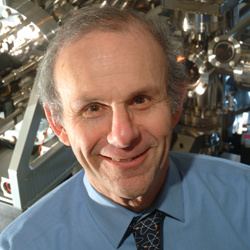 His laboratory is developing bioreabsorbable electronics in one-dimensional, two-dimensional, and three-dimensional architectures. He imagines these electronics could be used for temporary monitors placed inside the body, which would dissolve and reabsorb in a matter of days or weeks. A temporary sensor could be laminated onto the brain, for example, to monitor temperature and pressure after a traumatic brain injury by wirelessly transmitting data to a smartphone or computer. Other Northwestern Engineering professors who presented their research included: Scott Barnett, Robert P.H. Chang, Vinayak Dravid, David Dunand, Kimberly Gray, Derk Joester, Erik Luijten, Tobin J. Marks, Hooman Moheseni, Aaron Packman, Mark Ratner, Ramille Shah, Samuel I. Stupp, and Christopher Wolverton.